^ a b Uma Majmudar (2005). Gandhi's pilgrimage of faith: from darkness to light. SUNY Press. p. 138. ISBN 9780791464052. https://books.google.com/books?id=xM4paHEq5oQC&pg=PA138. 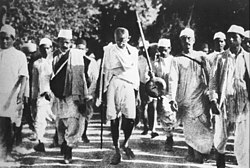 ^ http://www.questia.com/PM.qst?a=o&d=9165422 "In this respect Satyagraha or non-violent resistance, as conceived by Gandhiji, has an important lesson for pacifists and war-resisters of the West. Western pacifists have so far proved ineffective because they have thought that war can be resisted by mere propaganda, conscientious objection, and organization for settling disputes." Date accessed: 14 September 2010. ^ マハトマ・ガンディー, letter to P. Kodanda Rao, 10 September 1935; in Collected Works of Mahatma Gandhi, electronic edition, vol. 67, p. 400. ^ King, Jr., Martin Luther (1998). Carson, Clayborne. ed. The Autobiography of Martin Luther King, Jr.. pp. 23–24. ISBN 0-446-52412-3. 'Satyagraha 100 Years Later', a retrospective with Arun Gandhi from デモクラシー・ナウ! Mahatma Gandhi And Salt Satyagraha book. Satyagraha in South Africa book. Dandi March And Salt Satyagraha book. Gandhian Satyagraha: An Analytical And Critical Approach book.